The townhouses 10A and 10B with the backdrop of the Friedrichswerder Church, which today houses the Schinkelmuseum. 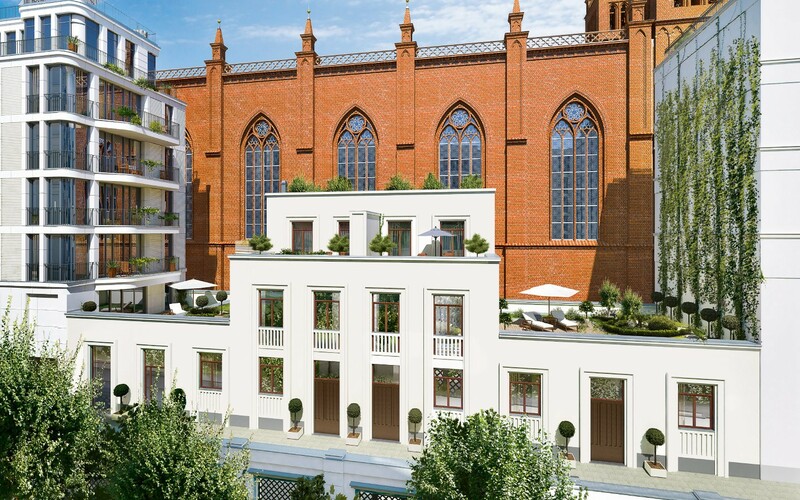 Your own townhouse, right in the centre of the Berlin capital. Charmingly placed within the attractive ensemble of houses at Crown Princes' Gardens, with plentiful space for individual spatial arrangements. This is a place with lavish private space for an optimum style of living – combinable, if you like, with your working needs. Townhouse 10 is partitioned into two parts, 10 A and 10 B, both planned as single-family houses by nps tchoban voss. 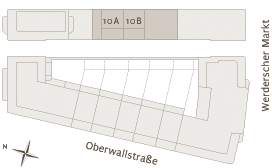 One part of the ground floor of 10 B is designed to facilitate commercial use. Both houses are arranged over three storeys and have a spacious terrace on the second floor. 10 B also features an enchanting rooftop garden on the first floor. It opens up majestic views both to the garden courtyard of Crown Princes' Gardens as well as to the impressive façades of the beautiful Friedrichswerder Church with its famous collection of sculptures owned by the State of Berlin. The fronts of townhouses 10 A and 10 B face onto Falkoniergasse on the western side, while the backs of the buildings face east onto the lane alongside Friedrichswerder Church. Both lanes are pedestrian only. The entrance to the houses is via Falkoniergasse, which is opened to the general public during daytime. But at night the public access is closed, ensuring the peace and security prevail.